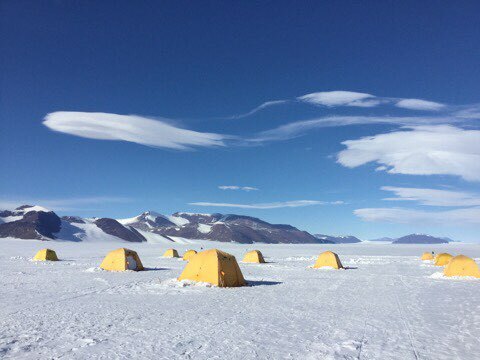 Decreased tents in the Shackleton Glacier Camp “tent city”. We were the last team out of there and now Shackleton Camp is being dismantled. It was its last season this year. It was a privilege to have gotten to know it. We arrived. Yesterday we got pulled out of Shackleton Glacier Camp via Basler and arrived in McMurdo (also lovingly called McTown) in the late afternoon. Now the entire team is reunited again, finally! We had a real shower last night, one with hot water and lots of water pressure. It was great. After a plentiful dinner we all got together to play trivia at one of the bars. We didn’t do so well but it didn’t matter because it is so great to see the other half if the team again and to finally catch up. -My fingers still wrinkle up after only 2 minutes in the shower. Liquid water exists in abundance and on demand and even though McMurdo is saving water by all means, it still feels like water is wasted at every corner and I can’t help but think about how much effort it would cost us to chip and melt ice and snow to get this much water. -There are sooooo many people here (755 to be exact)!! It’s crazy! It’s loud and noisy. But fun to see so many of the old faces and friends that we had met and made during our first few days in McTown at the beginning of the season. -It is fabulous to not worry about what to eat, how to thaw it, and how to cook it. Someone else is doing the cooking and there is food here available (and unfrozen) in abundance 24 hours a day. And realizing -after finishing a meal- that someone else is going to do dishes for you is the best feeling EVER!! -Money. You need money here. I totally forgot. We went to one of the two bars that exist here last night to play trivia and I forgot that snacks and drinks are not free. Weird!! -Sleeping in a soft bed in a room that has very dark curtains is incredible. OMG! My body basically collapsed last night and I didn’t wake up for almost 10 hours straight. I was not restricted in my movements (unlike inside a sleeping bag), no bright sunshine, and for the first time in a very long time no part of my body felt cold at night. Amazing. This was the best sleep I have gotten in years. -Bathrooms. You will not believe how nice it is to go pee without putting on a gazillion layers of clothes, running towards to poo tent, and peeing really fast before your bum freezes off. We can pee as often as we want here and all we have to do is go down a hallway in the warmth. So great! I still feel weird about toilets and all the water that is wasted in such a way though. -Wearing hiking boots instead of bunny boots makes a huge difference. I suddenly can lift my feet again and walking around feels so easy. -Also being at sea-level again after being at about 10,000 feet for 5 weeks feels amazing. -But the most amazing thing is the weather. The weather is super hot here, it’s 25 F (-4C). I can walk around without Big Red and I’m still sweating. I feel like we are in the tropics! It’s incredible how used the body gets to the extreme cold temperatures. All in all, it is wonderful to be back but I also already miss the deep field scenery, our cozy tent that protected us for 5 weeks and was our home, and even the icy wind with the blowing snow that makes this faint bell-like ringing I miss. It was an incredible experience with beauty and beasts alike. Today we will unpack pallets, sort our cargo, wash dishes and clothes, sort food, return gear, and so on. I’m excited to spend the last 2 weeks with the entire team reunited, chatting, catching up, hiking, exploring in and around McTown, and simply having more fun. Juliane, McMurdo, Antarctica, Jan.18th, 5:40pm.